For a high-speed network on a small scale, nothing delivers like this stylish powerhouse. 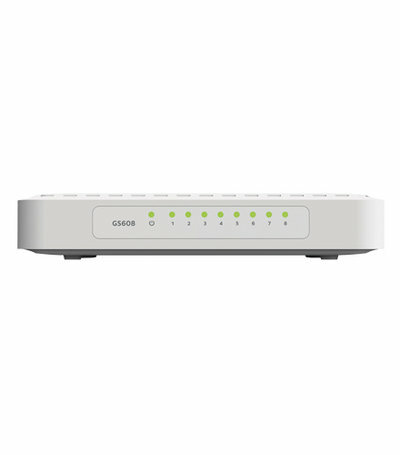 This fast, easy, and affordable Gigabit switch gives your home network the maximum capacity to handle huge bandwidth. Packed with ease-of-use features to simplify your networking experience, its sleek design makes it look great on a desktop – either flat or in the provided stand. The GS608 moves very large files such as high-end multimedia, gaming, Internet access, and other speed-intensive applications across your network instantly, and because it is standards-based, it painlessly integrates existing 10, 100, and 1000 Mbps devices on your network. The fan-less design results in silent operation allowing you to focus on your game or relax to your music. Matched with NETGEAR’s thorough testing, the GS600 switches provide long-lasting performance you can count on.